A time will come when science will transform [our bodies] by means which we cannot conjecture... And then, the earth being small, mankind will migrate into space, and will cross the airless Saharas which separate planet from planet, and sun from sun. The earth will become a Holy Land which will be visited by pilgrims from all quarters of the universe. According to my derivative hypothesis, a change takes place first in the structure of the animal, and this, when sufficiently advanced, may lead to modifications of habits… . “Derivation” holds that every species changes, in time, by virtue of inherent tendencies thereto. “Natural Selection” holds that no such change can take place without the influence of altered external circumstances educing or selecting such change… . The hypothesis of “natural selection” totters on the extension of a conjectural condition, explanatory of extinction to the majority of organisms, and not known or observed to apply to the origin of any species. In On the Anatomy of Vertebrates (1868), Vol. 3, 808. All these delusions of Divination have their root and foundation from Astrology. For whether the lineaments of the body, countenance, or hand be inspected, whether dream or vision be seen, whether marking of entrails or mad inspiration be consulted, there must be a Celestial Figure first erected, by the means of whole indications, together with the conjectures of Signs and Similitudes, they endeavour to find out the truth of what is desired. In The Vanity of the Arts and Sciences (1530), translation (1676), 108. Almost everyone... seems to be quite sure that the differences between the methodologies of history and of the natural sciences are vast. For, we are assured, it is well known that in the natural sciences we start from observation and proceed by induction to theory. And is it not obvious that in history we proceed very differently? Yes, I agree that we proceed very differently. But we do so in the natural sciences as well. In both we start from myths—from traditional prejudices, beset with error—and from these we proceed by criticism: by the critical elimination of errors. In both the role of evidence is, in the main, to correct our mistakes, our prejudices, our tentative theories—that is, to play a part in the critical discussion, in the elimination of error. By correcting our mistakes, we raise new problems. And in order to solve these problems, we invent conjectures, that is, tentative theories, which we submit to critical discussion, directed towards the elimination of error. The Myth of the Framework: In Defence of Science and Rationality (1993), 140. Another argument of hope may be drawn from this–that some of the inventions already known are such as before they were discovered it could hardly have entered any man's head to think of; they would have been simply set aside as impossible. For in conjecturing what may be men set before them the example of what has been, and divine of the new with an imagination preoccupied and colored by the old; which way of forming opinions is very fallacious, for streams that are drawn from the springheads of nature do not always run in the old channels. Translation of Novum Organum, XCII. In Francis Bacon, James Spedding, The Works of Francis Bacon (1864), Vol. 8, 128. At the voice of comparative anatomy, every bone, and fragment of a bone, resumed its place. I cannot find words to express the pleasure I have in seeing, as I discovered one character, how all the consequences, which I predicted from it, were successively confirmed; the feet were found in accordance with the characters announced by the teeth; the teeth in harmony with those indicated beforehand by the feet; the bones of the legs and thighs, and every connecting portion of the extremities, were found set together precisely as I had arranged them, before my conjectures were verified by the discovery of the parts entire: in short, each species was, as it were, reconstructed from a single one of its component elements. Geology and Mineralogy (1836), Vol. I, 83-4. Letter to Rev. C. J. Ellicott, Bishop of Gloucester and Bristol (22 Nov 1876). Quoted in Lewis Campbell and William Garnett, The Life of James Clerk Maxwell (1882), 394. Firm support has been found for the assertion that electricity occurs at thousands of points where we at most conjectured that it was present. Innumerable electrical particles oscillate in every flame and light source. We can in fact assume that every heat source is filled with electrons which will continue to oscillate ceaselessly and indefinitely. All these electrons leave their impression on the emitted rays. We can hope that experimental study of the radiation phenomena, which are exposed to various influences, but in particular to the effect of magnetism, will provide us with useful data concerning a new field, that of atomistic astronomy, as Lodge called it, populated with atoms and electrons instead of planets and worlds. 'Light Radiation in a Magnetic Field', Nobel Lecture, 2 May 1903. In Nobel Lectures: Physics 1901-1921 (1967), 40. From this fountain (the free will of God) it is those laws, which we call the laws of nature, have flowed, in which there appear many traces of the most wise contrivance, but not the least shadow of necessity. These therefore we must not seek from uncertain conjectures, but learn them from observations and experimental. He who is presumptuous enough to think that he can find the true principles of physics and the laws of natural things by the force alone of his own mind, and the internal light of his reason, must either suppose the world exists by necessity, and by the same necessity follows the law proposed; or if the order of Nature was established by the will of God, the [man] himself, a miserable reptile, can tell what was fittest to be done. Having always observed that most of them who constantly took in the weekly Bills of Mortality made little other use of them than to look at the foot how the burials increased or decreased, and among the Casualties what had happened, rare and extraordinary, in the week current; so as they might take the same as a Text to talk upon in the next company, and withal in the Plague-time, how the Sickness increased or decreased, that the Rich might judg of the necessity of their removal, and Trades-men might conjecture what doings they were likely to have in their respective dealings. From Natural and Political Observations Mentioned in a Following Index and Made upon Bills of Mortality (1662), Preface. Reproduced in Cornelius Walford, The Insurance Cyclopaedia (1871), Vol. 1, 286. Italicizations from another source. 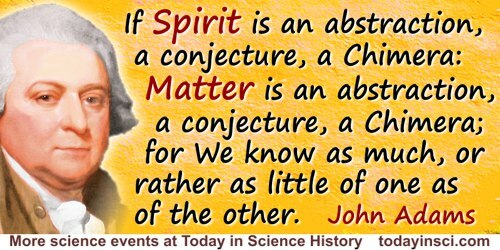 If Spirit is an abstraction, a conjecture, a Chimera: Matter is an abstraction, a conjecture, a Chimera; for We know as much, or rather as little of one as of the other. In Letter (26 May 1817) to Thomas Jefferson. In all speculations on the origin, or agents that have produced the changes on this globe, it is probable that we ought to keep within the boundaries of the probable effects resulting from the regular operations of the great laws of nature which our experience and observation have brought within the sphere of our knowledge. When we overleap those limits, and suppose a total change in nature's laws, we embark on the sea of uncertainty, where one conjecture is perhaps as probable as another; for none of them can have any support, or derive any authority from the practical facts wherewith our experience has brought us acquainted. Observations on the Geology of the United States of America (1817), iv-v. In defining an element let us not take an external boundary, Let us say, e.g., the smallest ponderable quantity of yttrium is an assemblage of ultimate atoms almost infinitely more like each other than they are to the atoms of any other approximating element. It does not necessarily follow that the atoms shall all be absolutely alike among themselves. The atomic weight which we ascribe to yttrium, therefore, merely represents a mean value around which the actual weights of the individual atoms of the “element” range within certain limits. But if my conjecture is tenable, could we separate atom from atom, we should find them varying within narrow limits on each side of the mean. Address to Annual General Meeting of the Chemical Society (28 Mar 1888), printed in Journal of the Chemical Society (1888), 491. In geology we cannot dispense with conjectures: [but] because we are condemned to dream let us ensure that our dreams are like those of sane men—e.g. that they have their foundations in truth—and are not like the dreams of the sick, formed by strange combinations of phantasms, contrary to nature and therefore incredible. Introducione alla Geologia, Part I (1811), trans. Ezio Vaccari, 81. De Magnete (1600). In William Gilbert and P. Fleury Mottelay (trans. ), William Gilbert of Colchester, physician of London: On the load stone and magnetic bodies (1893), xlvii. In the space of one hundred and seventy-six years the Lower Mississippi has shortened itself two hundred and forty-two miles. That is an average of a trifle over one mile and a third per year. Therefore, any calm person, who is not blind or idiotic, can see that in the old Oolitic Silurian Period, must a million years ago next November, the Lower Mississippi River was upward of one million three hundred thousand miles long, and stuck out over the Gulf of Mexico like a fishing-rod. And by the same token any person can see that seven hundred and forty-two years from now the Lower Mississippi will be only a mile and three-quarters long, and Cairo and New Orleans will have their streets joined together, and be plodding comfortably along under a single mayor and a mutual board of aldermen. There is something fascinating about science. One gets such wholesale returns of conjecture out of such a trifling investment of fact. Life on the Mississippi (1883, 2000), 173. It often happens that men, even of the best understandings and greatest circumspection, are guilty of that fault in reasoning which the writers on logick call the insufficient, or imperfect enumeration of parts, or cases: insomuch that I will venture to assert, that this is the chief, and almost the only, source of the vast number of erroneous opinions, and those too very often in matters of great importance, which we are apt to form on all the subjects we reflect upon, whether they relate to the knowledge of nature, or the merits and motives of human actions. It must therefore be acknowledged, that the art which affords a cure to this weakness, or defect, of our understandings, and teaches us to enumerate all the possible ways in which a given number of things may be mixed and combined together, that we may be certain that we have not omitted anyone arrangement of them that can lead to the object of our inquiry, deserves to be considered as most eminently useful and worthy of our highest esteem and attention. And this is the business of the art, or doctrine of combinations ... It proceeds indeed upon mathematical principles in calculating the number of the combinations of the things proposed: but by the conclusions that are obtained by it, the sagacity of the natural philosopher, the exactness of the historian, the skill and judgement of the physician, and the prudence and foresight of the politician, may be assisted; because the business of all these important professions is but to form reasonable conjectures concerning the several objects which engage their attention, and all wise conjectures are the results of a just and careful examination of the several different effects that may possibly arise from the causes that are capable of producing them. Ars conjectandi (1713). In F. Maseres, The Doctrine of Permutations and Combinations (1795), 36. Life is not the object of Science: we see a little, very little; And what is beyond we can only conjecture. In Samuel Johnson and William P. Page (ed. ), 'Causes Which Produce Diversity of Opinion', The Life and Writings of Samuel Johnson (1840), Vol. 2, 244. Nothing is known in our profession by guess; and I do not believe, that from the first dawn of medical science to the present moment, a single correct idea has ever emanated from conjecture: it is right therefore, that those who are studying their profession should be aware that there is no short road to knowledge; and that observation on the diseased living, examination of the dead, and experiments upon living animals, are the only sources of true knowledge; and that inductions from these are the sole bases of legitimate theory. Astley Paston Cooper, Astley Cooper, Bransby Blake Cooper, A Treatise on Dislocations and Fractures of the Joints (1851), 155. The Collected Works of Ambrose Bierce (1911), Vol. 7, The Devil's Dictionary, 232. Science would have us believe that such accuracy, leading to certainty, is the only criterion of knowledge, would make the trial of Galileo the paradigm of the two points of view which aspire to truth, would suggest, that is, that the cardinals represent only superstition and repression, while Galileo represents freedom. But there is another criterion which is systematically neglected in this elevation of science. Man does not now—and will not ever—live by the bread of scientific method alone. He must deal with life and death, with love and cruelty and despair, and so must make conjectures of great importance which may or may not be true and which do not lend themselves to experimentation: It is better to give than to receive; Love thy neighbor as thyself; Better to risk slavery through non-violence than to defend freedom with murder. We must deal with such propositions, must decide whether they are true, whether to believe them, whether to act on them—and scientific method is no help for by their nature these matters lie forever beyond the realm of science. In The End of the Modern Age (1973), 89. Since the discovery of secret things and in the investigation of hidden causes, stronger reasons are obtained from sure experiments and demonstrated arguments than from probable conjectures and the opinions of philosophical speculators of the common sort; therefore to the end that the noble substance of that great loadstone, our common mother (the earth), still quite unknown, and also the forces extraordinary and exalted of this globe may the better be understood, we have decided first to begin with the common stony and ferruginous matter, and magnetic bodies, and the parts of the earth that we may handle and may perceive with the senses; then to proceed with plain magnetic experiments, and to penetrate to the inner parts of the earth. On the Loadstone and Magnetic Bodies and on the Great Magnet the Earth: A New Physiology, Demonstrated with many Arguments and Experiments (1600), trans. P. Fleury Mottelay (1893), Author’s Preface, xlvii. The art of discovering the causes of phenomena, or true hypothesis, is like the art of deciphering, in which an ingenious conjecture greatly shortens the road. In Gottfried Leibniz and Alfred Fideon Langley (trans. ), 'Leibniz’s Critique of Locke', New Essays Concerning Human Understanding (1896), Book 4, Chap. 12, 526. The development of mathematics toward greater precision has led, as is well known, to the formalization of large tracts of it, so that one can prove any theorem using nothing but a few mechanical rules... One might therefore conjecture that these axioms and rules of inference are sufficient to decide any mathematical question that can at all be formally expressed in these systems. It will be shown below that this is not the case, that on the contrary there are in the two systems mentioned relatively simple problems in the theory of integers that cannot be decided on the basis of the axioms. 'On Formally Undecidable Propositions of Principia Mathematica and Related Systems I' (193 1), in S. Feferman (ed. ), Kurt Gödel Collected Works: Publications 1929-1936 (1986), Vol. I, 145. The entire annals of Observation probably do not elsewhere exhibit so extraordinary a verification of any theoretical conjecture adventured on by the human spirit! In The Planet Neptune: An Exposition and History (1848), 90. The verification of the existence of the planet Neptune was made when Johan Galle found a star in an evening observation at the position predicted in the letter he received from Le Verrier earlier that same day. The mathematician pays not the least regard either to testimony or conjecture, but deduces everything by demonstrative reasoning, from his definitions and axioms. Indeed, whatever is built upon conjecture, is improperly called science; for conjecture may beget opinion, but cannot produce knowledge. In Essays on the Intellectual Powers of Man, Essay 1, chap. 3. The philosophical study of nature rises above the requirements of mere delineation, and does not consist in the sterile accumulation of isolated facts. The active and inquiring spirit of man may therefore be occasionally permitted to escape from the present into the domain of the past, to conjecture that which cannot yet be clearly determined, and thus to revel amid the ancient and ever-recurring myths of geology. Views of Nature: Or Contemplation of the Sublime Phenomena of Creation (1850), trans. E. C. Otte and H. G. Bohn, 375. The rules of scientific investigation always require us, when we enter the domains of conjecture, to adopt that hypothesis by which the greatest number of known facts and phenomena may be reconciled. In The Physical Geography of the Sea (1855), 123. The science of medicine is founded on conjecture, and improved by murder. The science of metaphysics promises more than it performs. The study of … metaphysics begins with a torrent of tropes, and a copious current of words, yet loses itself at last, in obscurity and conjecture, like the Niger in his barren deserts of sand. The world has arisen in some way or another. How it originated is the great question, and Darwin's theory, like all other attempts, to explain the origin of life, is thus far merely conjectural. I believe he has not even made the best conjecture possible in the present state of our knowledge. In Evolution and Permanence of Type (1874), 12. This leads us to ask for the reasons which call for this new theory of transmutation. The beginning of things must needs lie in obscurity, beyond the bounds of proof, though within those of conjecture or of analogical inference. Why not hold fast to the customary view, that all species were directly, instead of indirectly, created after their respective kinds, as we now behold them,--and that in a manner which, passing our comprehension, we intuitively refer to the supernatural? Why this continual striving after “the unattained and dim,”—these anxious endeavors, especially of late years, by naturalists and philosophers of various schools and different tendencies, to penetrate what one of them calls “the mystery of mysteries,” the origin of species? To this, in general, sufficient answer may be found in the activity of the human intellect, “the delirious yet divine desire to know,” stimulated as it has been by its own success in unveiling the laws and processes of inorganic Nature,—in the fact that the principal triumphs of our age in physical science have consisted in tracing connections where none were known before, in reducing heterogeneous phenomena to a common cause or origin, in a manner quite analogous to that of the reduction of supposed independently originated species to a common ultimate origin,—thus, and in various other ways, largely and legitimately extending the domain of secondary causes. Surely the scientific mind of an age which contemplates the solar system as evolved from a common, revolving, fluid mass,— which, through experimental research, has come to regard light, heat, electricity, magnetism, chemical affinity, and mechanical power as varieties or derivative and convertible forms of one force, instead of independent species,—which has brought the so-called elementary kinds of matter, such as the metals, into kindred groups, and raised the question, whether the members of each group may not be mere varieties of one species,—and which speculates steadily in the direction of the ultimate unity of matter, of a sort of prototype or simple element which may be to the ordinary species of matter what the protozoa or component cells of an organism are to the higher sorts of animals and plants,—the mind of such an age cannot be expected to let the old belief about species pass unquestioned. 'Darwin on the Origin of Species', The Atlantic Monthly (Jul 1860), 112-3. Also in 'Natural Selection Not Inconsistent With Natural Theology', Darwiniana: Essays and Reviews Pertaining to Darwinism (1876), 94-95. What certainty can there be in a Philosophy which consists in as many Hypotheses as there are Phaenomena to be explained. To explain all nature is too difficult a task for any one man or even for any one age. 'Tis much better to do a little with certainty, & leave the rest for others that come after you, than to explain all things by conjecture without making sure of any thing. Quoted in Richard S. Westfall, The Life of Isaac Newton (1994), 256.